Q: How long should the vehicle ramp be? A: For vehicle ramps Health & Safety recommend that no gradient greater than 30% (16.5 degrees) should be used. To calculate your gradient simply multiply the bed height of your vehicle by 3.3 to give the optimum length. If you need your ramps to access buildings, whilst using a wheelchair for example, then simply use the height of the step or steps as you as your height difference. The recommended gradient for public buildings is 6%. For wheelchair ramps please see our wheelchair ramp buying guide. Q: How durable are aluminum ramps compared to steel? A: If the ramps are used sensibly, there is no reason why aluminum ramps should not last as long as steel. Q: Can I use a winch to assist loading equipment? A: Winches fundamentally alter the normal weight distribution when loading machines and equipment. Stated weight limits are dramatically reduced when using a winch. Winches can be used but great care and attention must be taken, please speak with our sales advisers for help specifying ramps. The most important thing is to keep the rope of winch parallel with the ramp. If you intend to use a winch please make this clear to your sales adviser before purchasing. Q: When in use, how do I secure the ramps to my vehicle? A: Safety is The primary concern and RampMaster can provide a number of very secure connection options to suit your vehicle, it is really up to you. Q: What if I need a specific length or width? 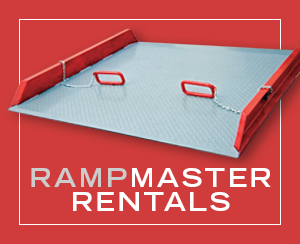 A: RampMaster can manufacture vehicle ramps or wheelchair ramps to any length or width. Q: Can RampMaster manufacture special applications/do custom builds? 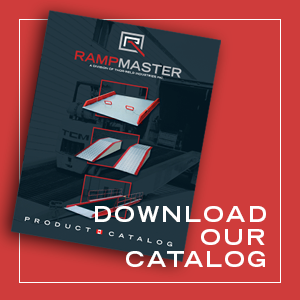 A: RampMaster manufactures a wide range of aluminum and steel extrusions and have been able to solve many unusual loading problems. Previous projects include purpose made plant ramps for drilling rigs, custom built truck ramps, ramps for unloading barges, vehicle ramps for the MOD and the oil industry along with many specialist plant ramps and car ramps. We can also manufacture bespoke ramps for wheelchairs and disabled access. Modifications undertaken by anyone other than RampMaster invalidate the warranty.